This is the time of year that we all call our favorite. Our spirit’s stir at the celebration of the birthday of the King. It is far more than history; it is our immersion into this real moment in time that shapes our eternity that grabs a hold of our lives. It may help you this Christmas to read along with a devotional for all the days in December. Each day a different DTS personnel authored a page in this booklet to focus your attention on Christmas. While each presentation is different, they are also the same. Jesus Christ is the focus. His birth is at the center of this collection. You will be drawn to worship, praise and celebration over this amazing season. Get your free Dallas Seminary Christmas Devotional today. Thanksgiving is a fabulous time of the year. The fast break-neck speed of our jobs, responsibilities and challenges can be put on pause for a few days. We take in a dozen deep cleansing breaths. The mind clears. Our soul warms. Then, our spirit testifies that God has indeed not only watched over us but blessed us with almost overlooked blessings that formulate our spirit of Thanksgiving. My bride and I were thrilled to take the long journey to visit family for this time of the year. It has been four years since we have been back to our home state and took the time to celebrate “Family” with our relatives from sides. Family roots bring an astounding depth of meaning into our lives. With a break in the many meals, house visits, telephone calls and hugs we drove out to Land’s End in San Francisco. We had been there many times in our past. This place gave us a moment of repose that set life back into balance. Our little rental care was safely parked and locked. We stepped out into the powerful winds that regularly pummel the coast. Birds played with the swirling gusts and thermals. The mighty Pacific lapped the rocky shores of the shoreline. As far as the eye could see echelons of waves marched to throw their power against the rocks below. Clouds raced by overhead driven by the same winds pushing the waves. In the middle of the sheer power of the West Coast environment we stood together locked arm in arm. Our jackets were zipped up tightly. Each of us pulled our caps snuggly over our heads. Lost in thought we remembered fondly wonderful years in this amazing city. Outstanding friends and past blessings ushered in by the goodness of God mesmerized our nostalgic respite. He has been very good to us. Like the bulwark of the rocky coasts standing strong against the pounding surf, the Almighty has stood beside us in ministry and the challenges of life where calling has marked our days. Whether facing joys or trials, He has proven Himself faithful. For all we have lived and faced together, we are thankful. One this tremendous day of celebration we have counted our blessings, named them one by one and concluded with hearts full of praise. He is very good. The long drive to this specialty store needs some planning. It is towards downtown. A quaint shopping area has a number of shops that catches the eye of my bride. But there was something a little brief in her comment, especially as she stepped lively into the destination store of her choice. She disappeared among the merchandise and the other customers. My sole objective was now to find a comfortable chair. Two men occupied the sofa. Another man was perched on one of the rolling step ladders. There a few yards away, around a few rounds of hanging garments, tucked in a room filled with mugs, dishes, utensils and kitchen items was an empty are chair. My brow furrowed, hands balled up and my steps were directed, intense and determined. That was my chair and no one was going to beat me to it. When I arrived safely and unchallenged, I paused next to my discovery and gazed around to ensure that my possession was without threats or competitors. Then, satisfied that I had mounted a successful offensive to claim this territory, I eased my finely tuned body of aching bones into the welcoming comfort of a chair made for Bruce. Comfortable and ready for a lengthy stay, I pulled out my cellphone to decide which game I would play while patiently waiting. Time passed, games got boring, emails were all completed and texting was done for the day. Leaning back I wondered what else I could do to pass the time. That’s when empty wine bottles caught my attention. Someone had a clever idea to add color, dimensions and arrangement to the store. 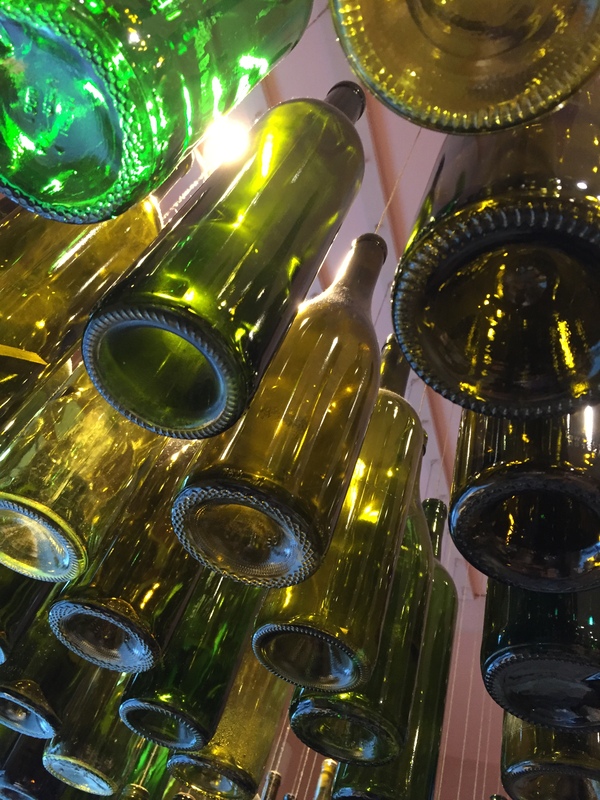 From the ceiling the artist or decorator had hung bottles from string. The arrangement was simple, uncomplicated and orderly. I was drawn to the display. God made us in His image and aesthetics is a value He instilled in us. At first I took a picture of the display as it hung as one of many decorations around the store. Then, I paused and looked up from the bottom. Tilting my camera at an angle for an unusual perspective, the dimensions and depth gave the photo very good appeal. After all, it did pull me out of my comfortable chair.